Nandana Surendran, an eighth grader from Texas, recommends Night, by Elie Wiesel. 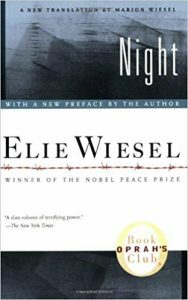 Night by Elie Wiesel is a fantastic as well as popular read among many middle and high schools. It is a book set place during the Holocaust; a deep and dark time in our history. I recommend Night because it gives you a first-person account of what happened during the Holocaust. There are also many morals and important themes throughout the story, such as family, religion, identity, mortality, freedom and confinement, violence, and race, and this book really allows you to understand these themes. Elie Wiesel was a Holocaust survivor, and his story allows you to feel the fear the Jews unfortunately felt at the time. The story also talks about the relationship Elie had with his father as well, how they stayed mentally strong throughout all their hardships and their daily struggle to stay alive. They remained together no matter what happened, and they were loyal to each other as well, even in times of starvation and death. Wiesel’s use of language and vocabulary in the novel was impeccable; his heartfelt imagery also added great emotion to the novel. He truly illuminated the terrors of the concentration camps so that others would understand what he and other prisoners experienced. Wiesel gave insight to how the Jewish people reacted to the situation of the concentration camps and how some lost their faith because of it. These reasons all sum up why Night is a must-read novel for everyone. I’m grateful that I got the opportunity to read this book, and I’m sure you will be too.